Facebook today paused the test of its mobile ad network, which lives in other apps that it splits revenue with, and reapplying resources to its mobile feed ads. Freed-up staff could work on bringing its lucrative FBX ad exchange to mobile. In fact, Facebook is already looking into the option, says sources. FBX mobile could boost earnings and get $FB above its IPO price faster than an ad network. We are pausing our mobile ads test off of Facebook. While the results we have seen and the feedback from partners has been positive, our focus is on scaling ads in mobile news feed before ads off of Facebook. We have learned a lot from this test that will be useful in the future. Facebook has notified all the partnered app developers and advertisers of the shut down and will honor commitments for campaigns through the end of the year. The fact is that since an ad network brings in lower margins because revenue has to be split with the developers who host the ads, getting it to the scale where it would really move the needle for Facebook could take time. The company wants to surpass its $38 IPO price as soon as possible to show it’s still strong and attract top talent. To do that it needs more revenue and profit. Still, far from being dead-pooled, expect the off-app ad network to come back with a vengeance. It won’t be the first time Facebook has paused a test to rework something before a bigger launch. It’s Pinterest-style Collections feature recently had its test shut down, but Facebook later clarified that this was to improve the product before making it available to everyone in the future. In the meantime, the engineers, product managers, and other team members who were working on the mobile ad network will be reassigned to work on Facebook’s mobile news feed ads. Business for those is booming, as developers are lining up to get a spot in the feed where ads take up most of the screen and get a user’s full attention. Facebook has to keep up with demand and make sure it’s serving the most relevant ads possible. Right now FBX ads are only appearing in Facebook desktop’s right-hand sidebar, but early results show the real-time bidding system for re-targeting ads based on cookies is crushing it. FBX takes someone’s browsing history and turns it into ads, so you might see an ad for a flight to Hawaii that you looked at but didn’t buy. But as we all know, people are increasingly accessing Facebook from mobile, so that’s where FBX needs to go. Accomplishing this could be a huge windfall for Facebook that would give it a leg up on other mobile advertising companies and make the shift to mobile actually a good thing for the social network. Cookie-based re-targeting creates a profile of someone’s desktop web browsing, and doesn’t work as well or at all on mobile. But since you use the same Facebook login on the web and mobile, Facebook could tie your desktop browsing history to your mobile identity and deliver the re-targeted ads there. That could mitigate another problem that Facebook has — annoying users by showing them more mobile ads. If the ads are for things people actually want to buy, they don’t seem as invasive. 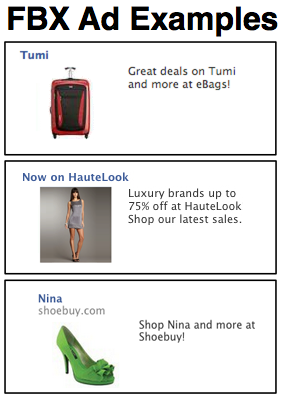 Everyone’s expecting FBX to soon be a major driver of Facebook’s revenue growth. Getting it on mobile could stomp on the gas. The ad network can wait.